Tuesday March 22nd 1892 We soon got our morning work done and finished the quilt by noon. I put some things in the roon after it was done. I sewed some on my other quilt. Wednesday March 23rd 1892 I finished fixing up the southwest room before noon and had only just got through when Mr Calkie came to take the room. I was sewing on my quilt what time I had. weather a little more pleasant. Thursday March 24th 1892 I done some sweeping and extra work about the house in the forenoon. I cleaned up the summer kitchen a little after dinner. The men were putting hay in the barn. I worked on my quilt. Fathers birth day. Friday March 25th 1892 We got our work done this morning and started to Woolfs to the quilting about ten oclock. The girls had a great time getting there for the [illeg]. We had a good dinner and a splendid visit. Will and Father came out there for dinner and the boys went to town. I read in the evening. Went to bed early. It was bright warm day. Saturday March 26th 1892 It was a rainy day. We were busy with the house work a great part of the day. I fixed me a dress and finished my quilt. Sunday March 27th 1892 We were busy with the work all the forenoon. Edith came home with her Uncle Will for dinner. The folks were over all afternoon. Will had gone over to Woolfs. I read and wrote in the evening. 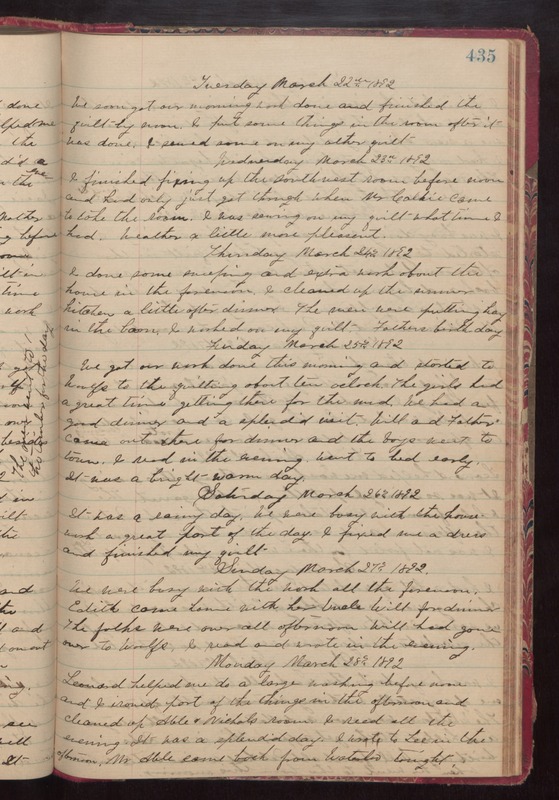 Monday March 28th 1892 Leonard helped me do a large washing before noon and I ironed part of the things in the afternoon and cleaned up Able & Nicholas room. I read all the evening. It was a splendid day. I wrote to Lee in the afternoon. Mr Able came back from Waterloo tonight.